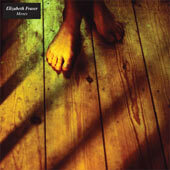 Elizabeth Fraser was the vocalist in Cocteau Twins. Since the dissolution of that band, she hasn't done a lot of music. There have been a few tunes here and there, and she did collaborate with Massive Attack, but mostly Ms. Fraser has lived the retired life, far from the public eye. Rumor in the fan community is that she has recorded an album, but that it has not been released because her perfectionist mastering tendencies are keeping the record in a constant state of production. She pretty much confirms this in in interview she did for UK publication The Guardian, so now we know that we have something to look forward to. The song Moses is part of what was recorded for this upcoming album, but it was sort of rushed out upon the death of Jake Drake-Brockman, Ms. Fraser's friend and the former keyboardist in Echo and the Bunnymen. Mr. Drake-Brockman died tragically in a motorcycle accident back in September, and this song, recorded as a collaboration between Drake-Brockman, Fraser, and Fraser's longtime partner Damon Reece, was released as a tribute to their lost friend. There are three tunes on this 12". The first of these is Moses itself, a sort of slow melancholy, vaguely Gallic tune. There is a prominent accordion line, a nice loping bass beat, and some funky percussion. Mr. Fraser sings in French, her voice in two nice layers. The overall effect seems to me to be what Massive Attack would have done if there were from suburban Paris instead of Bristol. There are also two remixes. The first of these is by Thighpaulsandra, who was in Spiritualized with Mr. Reece, as well as being in dozens of other acts. His version of the song is more electro sounding, with prominent keyboard. He also twists the accordion sound just a little, somehow making this version seem more Middle Eastern than French. When you think about it, that sort of droning noise is prominent in the folk music of both cultures, and i find it interesting that however Thighpaulsandra has emphasized the instrument makes it seem from farther East than the original mix does. In addition, the bass sounds more like a synth bass here, and the guitar is almost proggy. This mix on the whole seems more from the 1980s than the original does, but it is still rather enjoyable. The second remix is by Spaceland, which is the operating name that of a Mr. Andy Jenks. I think that his remix is the best treat here. He has stripped the song down to its barest elements, making a minimal skeletal song that showcases Fraser's voice to great effect. The songs ebbs and flows nicely, reaching a part in the middle that is almost a cappella. This is a really beautiful treatment, and i hope that the bulk of her future album leans towards this type of sound. Overall, Moses is a nice little tune. It is not shockingly new or different, but it is pleasant enough. The two remixes flesh out the 12" nicely providing two different takes on the song. I look forward to more music from Ms. Fraser, and hope that we get it sooner rather than later.